new northloop rrecord for the Clubsport S... VW presented today a new northloop record for the Clubsport S driven late October 2016.
this is a striped out car, its hard to compare the times of a hatch with no back seats with a normal production car for the road. Normally youd think that Nurburgring lap times give a good indication to other lap times but the variances are too high, the degree of a factory "qualifying pace lap" and a simple magazine editor lap is the difference of 20 seconds. Simply because it makes a good time here, Certainly does not mean its other times will be outstanding, Thats the problem with people looking at Ring times, It does not reflect every other times. Guys, that is anyway an outstanding lap time, if it is good at Nurburgring it will be good at any track - rest stays in hands of the driver ???? Congratulations to VW for that record! Exactly, Alot of cars today that go for a record, Or a fast time on the Ring are often fitted with harness's and cages, Its a safety precaution, Your not exactly going slow on one of the most dangerous track in the world, Plus theres insurance issues, And the opinion of the one driving to take into consideration. But the Civics times was quite different, Ans NIN pointed out, Honda should have never even released that time or that video, It was beyond retarded. a) the a/c was removed even though all production cars have a/c. b) the audio system was removed even though all production cars have audio. c) the front passenger seat was removed even though all production cars have a passenger seat. d) the tires were non-production/non-approved prototypes. Is this not the same reason, the civic type R's time is not approved here??? A "Clubsport S-version" is typically and especially built for the Nordschleife (as long it is a german car), so the very good pace here is nothing really surprising. Let's wait for some other track-times and you will see it's relativity, I suppose. Dont no what the US has anything to do with, And the price compared to a Camaro SS in the UK and Germany are similiar, Hell there damn near the same, Other then the Civic Type R, And Megane 275, There isnt any other Fwd car to compare it to, But in that price range, There are others beyond Fwd one can look at, But depends on what they want. 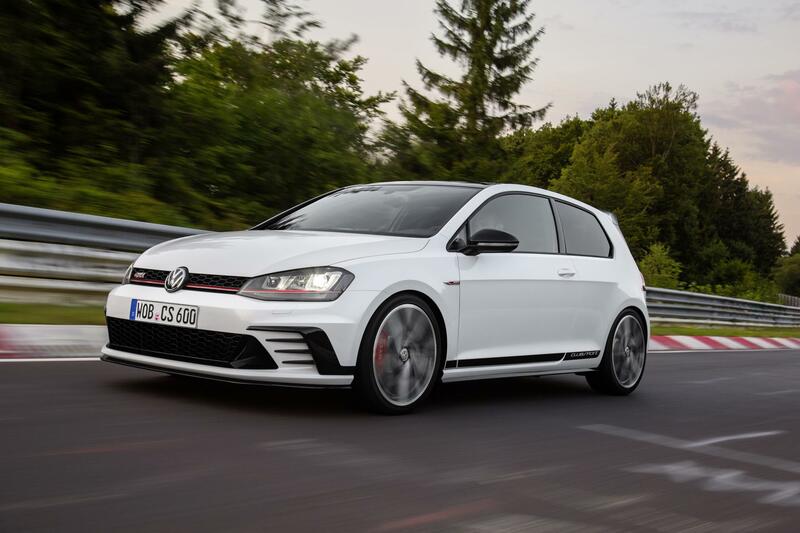 price will be somewere between the normal GTI Clubsport (34.925Euro incl19% tax) and the Golf R (39.500Euro incl 19% tax) in Germany. For a 400 car limited edition special able to lap in sub 7:50min the northloop that IS BARGAIN. that are the fastest FWD cars on the northloop. For the same price, You could get a Camaro SS which will tear this car to pieces in every way, Or a Focus RS or a 370Z, It will be a great car no doubt, But id rather have something else, But a Golf will always be special, Its got that handling and certain feeling characteristic that no other car has, But id still want something else. I wonder how many differences are on this car vs the regular clubsport. It's an impressive time especially when you consider this isn't a massively underated engine, with the boost turned up to 11. You can see, at the end of the straight, the car managed only 250kph, while the civic type R (claimed 306hp) hit 270kph. So in theory the car, chassis and tires are much more track-able in the handling than the civic.